Yesterday I felt the urge to work in glass. Of course, since it's 100 degrees plus outside, that makes it the prime time of the year for going out to the sunroom to turn on a torch and kiln. Yes, I have AC, but it's not nearly enough. It keeps the temperature about a balmy 90 degrees. Even so, I had fun making a few treetop beads. I've decided to limit myself a bit, in the hopes of getting something to show for my efforts. It seems sometimes that I go out there and try a zillion variations and nothing is good enough to keep from the junk bowl. I know I can make this basic bead style, but I'm not happy with the coloration, so I'm just going to play with variations on a single theme to get more data. 2) Enamel around the center. 3) Stringer wrapped ends + branches. 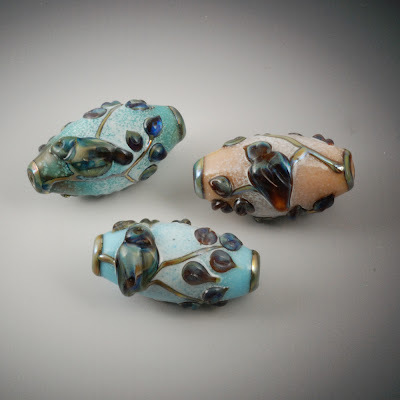 4) Leaves, trying to get a better handle on the color variations I see with the silver glass I use. 5) Bird, only one per bead to keep the time down. 1) How fast can I make one? 2) What base colors do I like? Does the silver glass react differently on the different colors? 3) Opaque, opaque + transparent casing, or transparent base? I didn't make many yesterday between the heat and other chores (some gardening, beginning to pack up the kitchen for the remodel starting next week, laundry), but these are the first three that I like. More detailed images available on Etsy. They are beautiful Vickie ! These are so wonderful Vickie. Your voice sings loud and sweet. I almost wish we could have a glass play date when you're here, but I can't play with fire in my apartment anyway. sigh. Thanks, everyone! Lora, maybe you should come for an extra day or two near Adorn Me and play at my house.